This off grid solar power system, also known as off grid photovoltaic system, is a kind of new grid-free power supply, and it can be mainly used to supply electricity for radio-relay stations, telephone booths, communication stations, scrolling panels, street lighting devices, and more. It is widely used in many places where traditional power is unstable, or the power system is incomplete, such as continental plateaus, islands, mountainous areas, field works, and that. This off grid solar photovoltaic system is able to control the charging and discharging of storage batteries by the means of its controller, and provide electricity for alternating current load by the inverter or for direct current load. With the ability to use the inexhaustible natural energy source, the off grid photovoltaic system can really help to effectively ease the electricity pressure in power-shortage areas. Equipped with storage batteries, this off grid solar power system can store electricity as the power supply in the night. And it can also be used together with other electric power source like wind power source, thus enhancing the reliability of electricity supply. 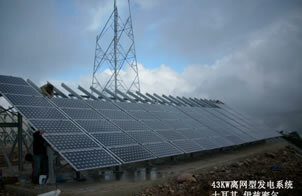 Eoplly is a professional manufacturer of off grid solar power system in China. In addition to off grid solar power system, we also have many other solar products for you, including monocrystalline and polycrystalline solar cells, monocrystalline and polycrystalline solar modules, solar lighting projects, building integrated photovoltaic systems, on grid solar power systems, portable solar chargers, and solar tracking systems. So far our products have received many certificates like IEC, TUV, CE, UL, MCS of the United Kingdom, ISO9001:2000, KSC of South Korea, and many other relevant authoritative certificates of Europe, America, and Asia. Besides, in order to offer better 24 hours' after-sale services for our customers, we have built up excellent high-efficiency global network in many countries like Germany, Italy, France, Spain, America, Korea, Bulgaria, and such. If you're interested in our off grid solar power system, please don't hesitate to contact us.